After 18 months of Pulsar Helion thermal vision use, the arrival of the new Pulsar Accolade was a teasing prospect but was all that glittered really gold? Going to a twin biocular format rather than just a single eyepiece initially left me with the thought that night vison in both eyes would be compromised, but after using the Accolade for a few weeks, my mind was changed. Much as marketing teams like to denounce the facts about human night vision capability and time taken for full adaptation to darkness, the benefits of both eyes in operation with the Accolade appeared more gradually. The simple fact I was able to commit to is that a Biocular format immerses and involves you within your otherwise invisible thermal environment whereas a Monocular seems more of a spectator’s viewpoint. Both Helion and Accolade use the same thermal processors and image enhancement technology, with my personal reference always being for close range focal capability and field of view to be treated as the priority between models. The second fact is the ergonomic benefits. Carrying the balanced Accolade around your neck more like a conventional binocular is easier with a short neck strap, perhaps even slung onto your chest above regular daylight binoculars is a possibility. Unlike the older Quantums, which had binocular like side mounting points for the neck strap, the long slender shape of the Helion hangs looser and can spin and rotate during carriage so not as easy or fast to lift to your eyes at often critically brief moments. The Accolade hangs straighter and having twin eyecups, fits into both orbital sockets, greatly assisting locking the device into position and you tend to feel far more solidly positioned within the smaller pinpoint focal zone of the ocular lenses that clarify the internal screen. The Helion, with one eyepiece, is critical and factually, more tiring as slight misalignment of your eye leads to an unfocussed image and takes fractions of a second to re-find the position for your eyeball from which you initially focussed the eyepiece. With tools liked the Stadiametric rangefinder and multiple control buttons, the Accolade clears up the tactile issues of finding the right button intuitively in darkness without a second thought, yet no matter how much I use the Helion, I still find myself applying pressure to the wrong clarinet style button layout for the function I desire. Plus, holding with both hands, keeps the image far more stable so again, less tiring during a process some may find a little nauseating. Weigh these factors off against cost and size! Well cost is undisputable, but I cant help but feel the ergonomic benefits are the key factor of choice, as is often the case with any optics where internal capabilities are almost identical. 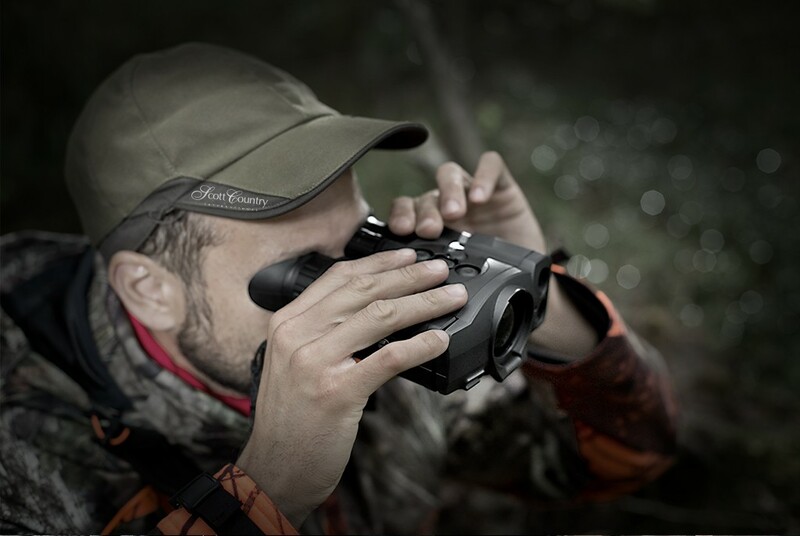 Both have a superb battery system and at the end of the day, if you need to keep full night vision capability in one eye, there is nothing stopping you using a single Accolade eyepiece to your `off riflescope` eye. Interestingly, if you try this with the single eyepiece of the Helion, it might look less bulky, but the carry strap to wrap your knuckles is only right handed, whereas you have full ambidextrous capability on the accolade. In the end, money is the only factor to my mind.